Whether you’re looking to treat yourself to the luxury of silk sheets because you want to take the very best care of your skin and hair, or you’re suffering from insomnia and need to get a better night of sleep, the investment in a set of silk sheets can change a lot of things about the way you sleep. From temperature control to allergy resistance, silk sheets can provide the best sleeping conditions for you. In this article we’ve gathered pertinent information to help you make a wise purchasing decision about the LilySilk Pure Silk Sheet Set. Fitted sheet includes elastic all the way around the product, not just on the corners, to ensure a secure fit on the mattress. OKEO-TEX Certified. This certification means that the product is completely free of unnatural chemicals and dyed with natural substances that will not produce unwanted fading or color shading results. This eco-friendly certification gives you the peace of mind to know that you are doing your part to keep the earth a happy and healthy place. Handmade. In order to protect the silk from unnecessary harsh treatment, these sheets are completely made by hand and not on machines. This allows the product to be treated safely and gently, promoting a stronger piece of silk and a more durable and lasting quality item. Possible Wrinkles. One concern with these sheets (as with most silk) is that after air drying they will likely be very wrinkled and may need to be ironed prior to putting them on the bed. Cost. As with most silk sheets, the cost of these is a big investment. This brand is comparable in price to most other silk sheet sets. 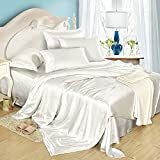 Most people who purchase silk sheets do so with the idea that they are using them every day and they are intended to be durable and provide a better quality sleep. In most cases, people who purchase these silk sheets agree that they are worth the higher price tag. 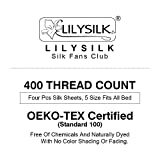 Located in China, the LilySilk Company was begun by Lily Lin when she returned to her homeland after working in the silk industry in France for more than a decade. The company is eight years old and serves people all over the world. They offer language support in more than 14 languages and work to promote social responsibility, worker welfare, and charity participation. The company has a wide range of products including bedding, clothing, accessories and more. Finding out what actual users of a product have to say about it gives you a better chance of knowing what you are going to be getting before you buy. Here we’ve gathered critical information to help you on your purchasing journey. One Amazon verified purchaser can’t say enough good things about this product! She machine washed and tumble dried them on a very delicate cycle, not noticing any shrinking or discoloration at all. She mentions that the seam edges are nicely finished and the silk is a consistent quality throughout the entire product. These silk sheets do not make you sweaty during sleep, and do not slip and slide around like synthetic satin does. The silk fabric is breathable and perfect for sleeping. Another very happy Amazon reviewer mentions that she needs help sleeping because of her fibromyalgia. She loves these sheets, although they do slowly slide off in the night—but a set of sheet straps has solves that problem. She also likes the fact that she purchased them in black as they seem to be the most resistant to stains. One other reviewer calls this a “worthy investment” as she bought it for her fourth wedding anniversary. Sleeping real silk has definitely convinced her that the cost of the sheets is worth every penny paid for it. She mentions that the sheets are lightweight, soft, and bit slippery. But they are quiet for sleeping and feel luxurious. This LilySilk sheet set is a high end product from a trusted company that meets and exceeds the standards and expectations of its customers. 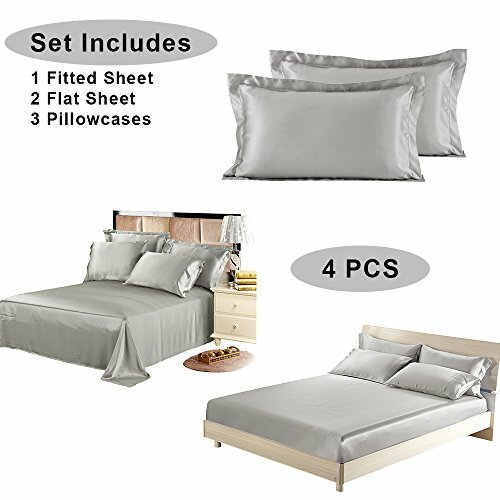 If you’re looking to splurge on a top quality silk sheet set that will last, you have come to the right place. Find Best Price on Amazon Now!